ERIE – On Oct. 25, 2010 the Clearfield County Economic Development Corporation (CCEDC) traveled to Erie, PA for the Fall 2010 Pennsylvania Economic Development Association (PEDA) conference. The three-day, semi-annual conference focused on Energizing Pennsylvania and Sustainable New Energy Practices. More than 100 Economic Development practitioners from across Pennsylvania were in attendance for the event. At the annual awards luncheon and general membership meeting held the second day of the conference, PEDA President, Robert Blair, announced the CCEDC as the 2009 Project of the Year Award recipient for the Bionol Clearfield, LLC project. Blair remarked, “Dec. 31, 2009 marked the end of a significant project and the beginning of a new era for Clearfield County. Bionol Clearfield, LLC in partnership with the CCEDC, pioneered to construct Pennsylvania’s first ethanol plant to position Clearfield County as the Energy Hub of Pennsylvania. The development of bio-fuels as an alternative to foreign oil is vital to the economy of the nation, the state of Pennsylvania and the environment.” Accepting the award on behalf of the CCEDC were Rob Swales and Jamie Straub. He took the opportunity to state the project started in the late 1800’s when the Harbison Walker Brick Plant opened its doors in Clearfield’s East End. In 1983 when the company closed its doors, not only did it displace over 1,000 workers, but it left a blighted scar at the entrance to Clearfield. It wasn’t until 1998 when redevelopment plans got underway and the Brownfield site was transformed into the Clearfield County Technology Park and the now Bionol Clearfield, LLC Ethanol Plant. Swales thanked the Awards committee for the recognition, he thanked the past and present directors of both the CCEDC and CCIDA for bringing the project to fruition and he acknowledged the efforts of past directors Linda Thompson and Tom Stojek. “Eleven years, twenty-two land owners and uncountable man hours went into the project and we are honored to have Bionol Clearfield, LLC here in Clearfield County,” said Swales. Straub remarked on the exhilaration of being recognized among fellow economic developers and colleagues. “It is a sense of accomplishment and goodwill to have those who understand your successes and dilemmas best, reward you with such an honor,” stated Straub. 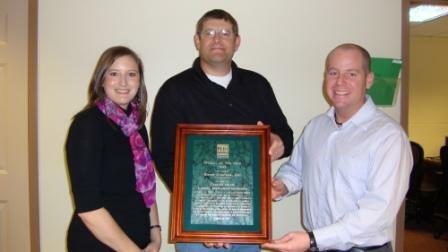 Swales and Straub were able to present Bionol’s Plant Manager, Roger Schmidt, with a plaque, commemorating the event. “Clearfield County has proved to be a perfect home for our facility, we have a dedicated workforce and many local industry partners, we would like to thank everyone for their participation to make this project a success,” Schmidt commented. The plaque was presented to Bionol on November 5, 2010. A second plaque was issued to BioEnergy’s home office in Quincy, Massachusetts.